But there are no plain facts, only data that have been selected from the ambiguous “data cloud” of reality. Our authorities are those who hold the rights of authorship and tell the rest of us stories of what it all means. If authority is power, then this power is a function of how convincing or inspiring an author’s story is, how effectively it influences the belief and behavior of others. Just now we’re starting to understand the extent in which fact selection, taking perspective, and constructing meaning are determined by a deeper belief regarding the persistent ambiguity of what’s really going on. Actually this deeper belief is energized by a need to resolve the ambiguity so it can be made to mean something. What I’m calling the “persistent ambiguity” of reality is profoundly intolerable to our minds, which work continuously to turn it into stories that make sense. Stories frame a context, make connections, establish causality, assign responsibility, attach value, and reveal a purpose (or likely consequence) that motivates us to choose a path and take action. 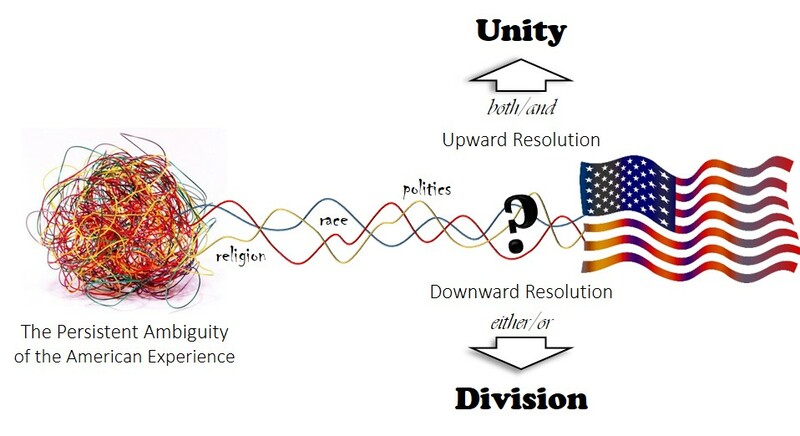 The resolution of ambiguity breaks in either of two directions: downward to (either/or) division or upward to (both/and) unity. Once the divisions are made – and remember, these are based on narrative constructs of difference – the battlefront is suddenly obvious to us and we are compelled to choose a side. Below the grey ambiguity is where we find the diametrical opposites of “this OR that.” There is no room for compromise, and one side must win over (or be better than) the other. Above the ambiguity is not simply more grey, but “this AND that” – not differences homogenized but mutually engaged in partnership. 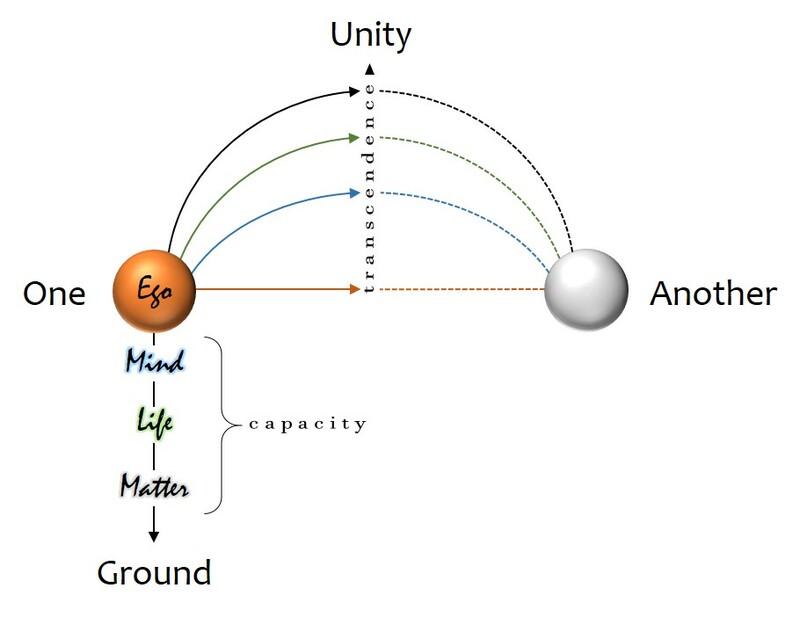 An upward resolution in unity means that distinctions are not erased but rather transcended in a higher wholeness. Up here, “this” and “that” are seen as symbions (interdependent organisms) in a larger ecosystem which both empowers and draws upon their cooperation. The reality of American life is and has always been persistently ambiguous. From the beginning there have been differences among us, and some of the most highly charged differences fall under the constructs of religion, race, and politics. We need to remind ourselves that these constructs are fictional categories and not objective realities. Being Black or White is one thing (in reality); what it means to be Black or White is quite another (in our minds). Race relations in American history have been complicated because each side is telling stories that exclude the other. The same can be said of religion and politics as well. No more grey forevermore, Amen. The more open-minded and cautiously hopeful among us nevertheless complain that because so many of these others are telling stories of conflict and exclusion, it might be better for the rest of us to leave them behind. They observe how our current president and the Religious Right that supports him share a conviction that “winning the deal” or “converting the sinner” is the only way forward. Once these stalwart true believers lose cultural real estate and finally die out, we will be able to make real progress. But that’s a story too, isn’t it? America is a national story about (1) racial diversity, religious freedom, and political dialogue; (2) around the central values of self-reliance, civic engagement, and enlightened community; (3) protecting the rights of all citizens to pursue happy, meaningful, and fulfilled lives. Is this story true? Well, what does it mean for a story to be true? According to constructivism, the truth of a story has to do with its power to shape consciousness, set a perspective, orient us in reality and inspire us to creatively engage the challenges we face with faith, hope, purpose, and solidarity. For most of our history true stories have brought us together in community. Indeed, they are the very origin of human culture. The provisional answer, then, must be that an American story of upward resolution (unity) will be true to the degree in which we devote ourselves to its realization. Short of inspired engagement, a story merely spins in the air without ever getting traction in reality. It never has a chance of coming true. Are there racial conflicts, religious bigotry, and political sectarianism in America? Yes, of course. But look more closely and you’ll find many, many more instances of interracial concord and friendship, a grounded and life-affirming spirituality, and individuals of different political persuasions talking with (rather than at) each other about ideals they hold in common. If we give the media authority to tell our American story, we can expect to hear and see more about where the ambiguity is breaking downward into division. Why is that? Because the media depend on advertisers, advertisers need eyeballs on their ads, and stories of aggression, violence, and conflict get our attention. Cha-ching. Strangely, but perhaps not surprisingly, if we hear the same story of division several times during a media cycle, our brain interprets it as if there were several different events – more frequent, more prevalent, and more indicative of what’s going on in the world. There’s no denying that we need leaders today who genuinely believe in the greater good, who dedicate their lives to its service, and who tell a story that inspires the rest of us to reach higher. Complaining about and criticizing the leaders we have will only amplify what we don’t want. The real work of resolving the persistent ambiguity of life is on each of us, every single day. Starting now, we can choose peace, wholeness, harmony, unity, and wellbeing. The stories we tell create the world in which we live. America is worthy of better stories. Now that you’ve completed the major work of becoming somebody – (I realize it’s an ongoing project and that construction may be stuck in a phase right now, but let’s pretend anyway) – the question of what’s next needs your attention. Of course, popular culture wants you to believe in yourself as an end-game: the highest goal and most significant achievement of a human career. From this point it’s nothing more than some ongoing identity maintenance, love-and-power struggles on the field with others like you, getting the most out of the time you have left, and maybe securing a forever home in heaven when you die. In other words, stop asking. To the extent that it has signed a deal with popular culture, religion plays right along. The doctrines of a personal deity, personal salvation, and personal immortality have conspired to create a veritable personality cult, with ego its focal obsession. It needs to be said straightway that this was not religion’s preoccupation for the longest time, when the primary concern was about linking personal identity to a deeper, larger, more enduring, and transpersonal reality. In other words, it’s not all about you. In the interest of moving our conversation out of the sticky web of orthodoxy, I want to put ego and personality in proper context. The evolution of personality and its executive center of identity is a very late achievement in the history of homo sapiens. Actually its deeper prehistory charts the development of early hominid species, while the emergence of a self-conscious personal identity marks the formal beginning of our own unique line. Our history since its emergence has been characterized by all the predictable complications that attend an experience of separation, exposure, insecurity, and alienation. In other posts I have explored how insecurity drives neurotic attachment and unrealistic expectations, which in turn lead to inevitable disappointment, deepening resentment, and finally existential despair. Along the way we are compelled to compete for what we need, pick fights with others, and grab for ourselves whatever we hope will make us happy – which nothing can, so we’re doomed. In order to break past this vortex of consumption, let’s try to open our frame wide enough to get all this nervous futzing in perspective. My diagram positions you (“One”) in relation to “Another,” where the other might be anyone or anything at all. As our task here is to better understand how a self-conscious personal identity fits into the bigger picture, we’ll begin our reflections at that level. Across from you, then, stands another more-or-less centered personality, with many of the the same quirks, hangups, and ambitions as you. This is properly the interpersonal plane of engagement, with your relationship carried in and complicated by the reciprocal influence of each of you on the other, and upon both of you by the general role play of society along with your respective family inheritances. Purely on this plane, your mutual concerns have to do with identity, recognition, agreement and belonging. If we imagine a horizon including both of you in this interaction, it would only be large enough to contain your unique and shared interests as self-conscious persons. If your self-identification is fully represented inside this interpersonal horizon, then nothing else really matters. It’s you and another, working out the meaning of life in your mutual struggle to be somebody. But as my diagram shows, your center of self-conscious identity (i.e., your ego) is only the surface manifestation of a much deeper process. 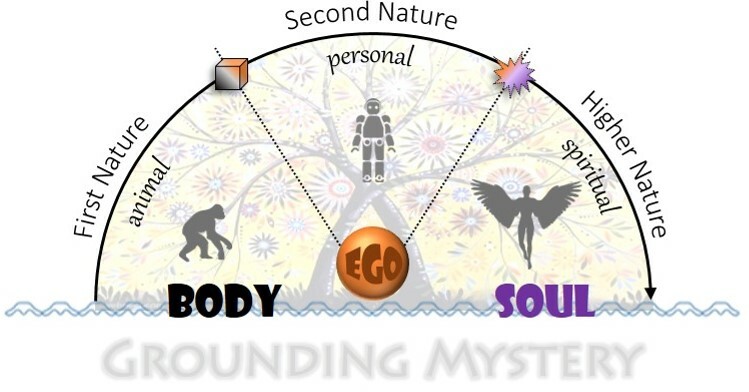 Supporting personality from farther below is a sentient nervous system managing the flow of information from your body’s interior and the external environment. This is where the feeling of what happens is registered. You are not only a person on a uniquely human social stage, but if you can release those concerns for a moment and become more mindful, you’ll find suddenly that your horizon of awareness opens by an exponential degree. Now included are not just human egos but all sentient beings – all other creatures that sense, desire, respond, and suffer. Notice how dropping down (or deeper within) to identify yourself as a sentient being opens your capacity to identify with other sentient beings. This was a fundamental insight of Siddhārtha Gautama, later named the Buddha (from budh, to wake up) for his breakthrough realization. Each subsequent drop to a deeper center, then, opens a still greater capacity of awareness, compassion, and goodwill on behalf of others like you. This inward descent corresponds to a transcendence of awareness through larger and larger horizons of identity – from interpersonal (ego), sentient (mind), and organic (life) communities, until it opens out to include the material universe itself. Lest we leave you out there floating weightless among the galaxies, our reflections can now return to your regard for and interactions with that other person. With your enlarged sense of identity as (quite literally) a personification of the universe, you are also witness to this self-same miracle in the other. Their true identity so radically transcends the masks, roles, and role plays defining who they are, as to lie almost entirely beyond their ability to imagine or accept. The other person’s enlightenment in this respect may seem utterly improbable to you. And yet, you managed to get over yourself and see the truth – did you not? What would happen if you both came to see the truth and started to live your lives with this higher wholeness in mind? How would it change what you care for, what you worry about, what you chase after, or what you hide from? In realizing that you are not separate in fact but only seem so by the delusion of ego consciousness, your next thought, your next choice, and the very next thing you do might serve as a light in the darkness, illumining the path of a liberated life. Maybe others will join you, or maybe you’ll walk alone for a while. And then again, it’s impossible to be alone when the universe is your home.